Another first for Recover My Flash Drive, we reverse engineered the pin-out for the monolithic SD card MMAGF02GWMCU-PA used by PNY in their Optima SD series of SD cards. This card seems like a OEM Samsung product so its possible that other companies are using it and just changing the sticker. 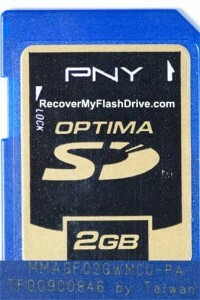 The monolithic card is 2GB in size and is easily identifiable by the MMAGF02GWMCU-PA markings on the back of the SD card. There are no markings on the monolithic SD card itself. The package seems to have available pins for a second IO bus and four CE lines but they aren’t in use with this specific card. The card uses Samsung NAND and possibly a Silicon Motion controller, I say possibly because there were no firmware related data structures that we typically see in Silicon Motion devices but the addressing and ECC implementation were the same as a previous generation of Silicon Motion controllers. The picture below is of the SD card with the solder mask removed. 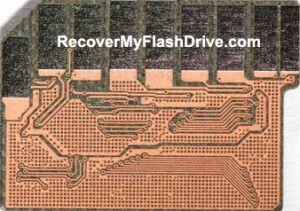 If you have one of these cards, chances are we’re the only company who can recover it so feel free to contact us.